Marin Solar Program can help you begin the process of evaluating whether the installation of a solar system is suitable for your home or business. Solar program staff can also perform a free preliminary analysis of your site's solar potential to determine if it has the physical properties to support a solar installation. You may also explore our solar potential maps to see if you are generally located in a strong solar potential area. For sites that have good solar potential, we strongly recommend that you get at least two Find a Contractor. Once you have the bids, we are happy to help you evaluate your options. To participate, contact Dana Armanino or phone her at (415) 473-3292. Please be ready to provide the address of the site where you would install solar. Sunlight is absorbed by the photovoltaic array creating direct current (DC) electricity. The array is can be mounted to the roof or the ground. The inverter takes the DC output and converts it to alternating current (AC). The AC output is then usable either in the building or elsewhere on the utility grid. 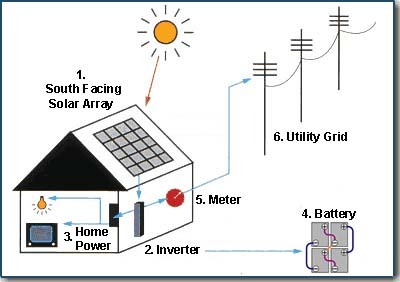 The utility grid, in a process called 'net metering'. In this case, the utility grid acts as a bank - the power you deposit can be withdrawn from the grid later on, when your PV system is not producing enough power to meet your household's energy needs (in the winter, for instance). There are a variety of incentives and financing options available to homeowners who wish to install solar systems. Please visit our Incentives and Financing page for more details on programs and rebates. Photovoltaic Cell - A device that produces electricity from light. Cells are the building block for modules. Photovoltaic Module - A number of PV cells connected together, sealed with an encapsulant, and having a standard size and output power; the smallest building block of the power generating part of a PV array. Photovoltaic Array - A group of photovoltaic panels. For information on each of the solar technologies shown below, please visit the Energy Savers website. The County of Marin is now providing free assistance to help residents and businesses take the first steps toward purchasing a photovoltaic system. Do I receive a reasonable amount of sunshine throughout the year? Look for areas that are free from shade, not blocked by trees or buildings. A shadow, even that of a small branch, can decrease the amount of power that is generated by your system. The County has tools to help you determine if your site is appropriate for solar. What can I do to increase my household energy efficiency before investing in solar? 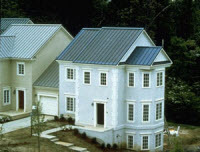 Are there financial incentives and rebates for installing solar? The County can help you work through these questions. If you are interested in learning how to answer these questions yourself, many edifying resources are available. Start with reading the following photovoltaic guides, made available through the California Energy Commission. Solar Rights Act Ensures that any covenant, restriction, or condition contained in any deed or other contractual restriction, which affects the sale or value of real property, does not limit the installation or use of a solar energy system. Online comprehensive buyers guide and business directory to more than 17,000 renewable energy businesses and organizations around the world. You can locate renewable energy businesses by geographic location, by product type, by business type and by name, or search for businesses using keywords. In August 2010, the County of Marin adopted an updated Wind Energy Conversion System (WECS) Ordinance. Get more information on the update and additional WECS information here. The Summary of California Energy website provides energy information on generation, demand, consumption, prices and sources for California. Information available by types of fuel, sector and county. From the CA Energy Commission. The Energy Statistics website provides energy information on prices, sales, demand and consumption for all energy types (including renewables). From the U.S. DOE Energy Information Administration.